Structure Activity Relationships (SAR) of MARPIN revealed the alpha-methylene cyclopentenone as a site critical for MARPIN's bioactivity and identified an appropriate site for immobilization. 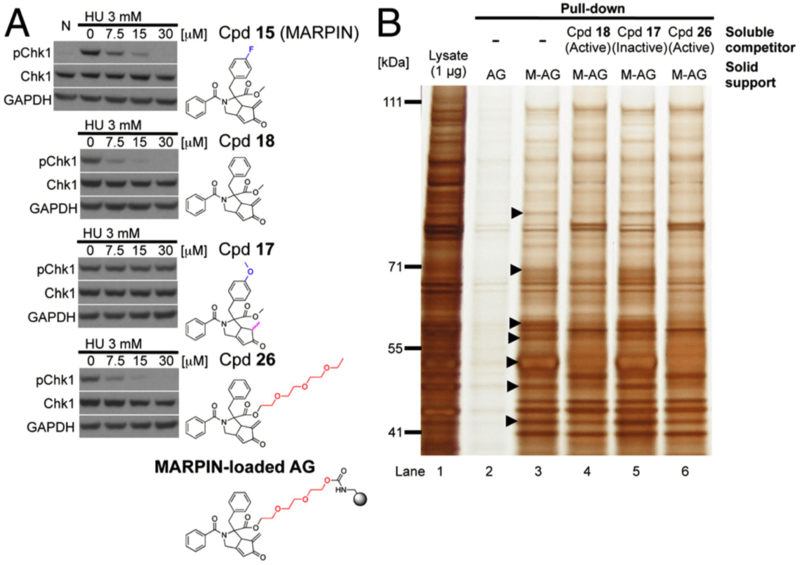 Screening of small-molecule libraries led to the identification of a compound, now called MARPIN (ATM and ATR pathway inhibitor), that sensitizes p53-deficient cells to diverse DNA-damaging agents. Derivatives of MARPIN were prepared to establish Structure Activity Relationship (SAR) data and to identify a suitable immobilization/attachment site for affinity matrix experiments. The alpha-methylene cyclopentenone is critical for MARPIN’s bioactivity. To detect MARPIN-binding proteins, MARPIN was pegylated and immobilized on the resin (MARPIN-loaded AffiGel). Unique chemical methodology enables the synthesis of innovative and diverse scaffolds and chemotypes and allows access to previously unexplored “chemical space.” Compound collections based on such new synthetic methods can provide small-molecule probes of proteins and/or pathways whose functions are not fully understood. We describe the identification, characterization, and evolution of two such probes. In one example, a pathway-based screen for DNA damage checkpoint inhibitors identified a compound, MARPIN (ATM and ATR pathway inhibitor) that sensitizes p53-deficient cells to DNA-damaging agents. Modification of the small molecule and generation of an immobilized probe were used to selectively bind putative protein target(s) responsible for the observed activity. The second example describes a focused library approach that relied on tandem multicomponent reaction methodologies to afford a series of modulators of the heat shock protein 70 (Hsp70) molecular chaperone. The synthesis of libraries based on the structure of MAL3-101 generated a collection of chemotypes, each modulating Hsp70 function, but exhibiting divergent pharmacological activities. For example, probes that compromise the replication of a disease-associated polyomavirus were identified. These projects highlight the importance of chemical methodology development as a source of small-molecule probes and as a drug discovery starting point.